Encourage and motivate students, particularly those from underrepresented groups, to pursue research careers in renewable energy. Create an environment in which students and faculty engage in transformative interdisciplinary research. Provide students with a curriculum that achieves both deep knowledge in their chosen field and inter-disciplinary knowledge across fields related to wind energy including exposure to state-of- the-art topics through an innovative real-time case study (on a proposed wind installation in Hull, MA), international exchanges, and training in participatory communication. Provide students with skills and strategies for professional success including mentoring and activities centered on career guidance and ethics. We will work with a local offshore wind project to expose students to an actual wind farm project, as it is happening. 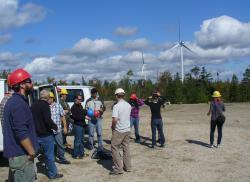 Students will be actively involved in environmental research needed to obtain the required permits, policy work to ensure public acceptance, and engineering work to gather wind and wave data, and to determine the most appropriate turbines, support structures, and layout.